“Limoges” porcelain ware is a generic term, because various factories and different studio artists manufactured and decorated a wide range of these wares during the 19th and 20th centuries. The first porcelain factory was established in Limoges, France, around 1771, a few years after the discovery of kaolin, or white clay, in nearby Saint-Yrieix-la-Perche. 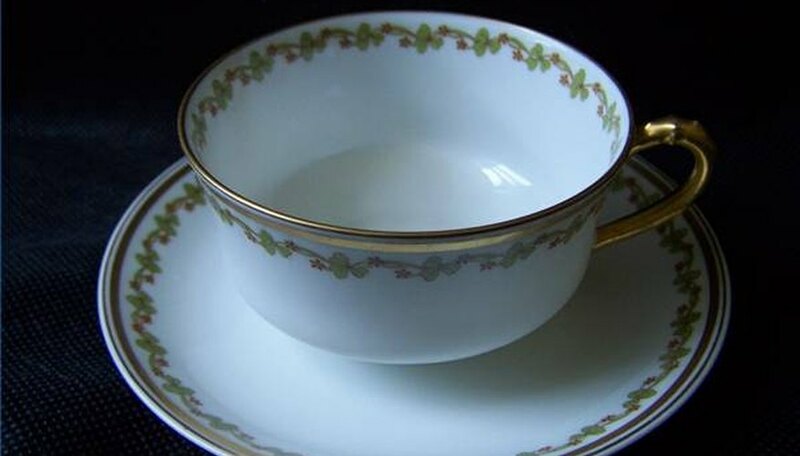 The expansion in factory production from five factories and seven kilns in 1808, to 35 factories and 120 kilns by 1900, reflected the increasing demand for Limoges porcelain ware. “Coronet" Limoges generally refers to the maker’s mark that appeared on the back of selected Limoges porcelain items. This particular mark is linked to Limoges porcelain ware manufactured in Europe and decorated in studios in Limoges, Paris and Germany before being exported overseas. As its name suggests, the mark is a crown with the brand name “Coronet,” usually in green or blue colors. George Borgfeldt, an importer based in New York, brought Coronet Limoges to the United States. His line of wares included plaques and plates ornately decorated in the Limoges tradition and bearing the signature of the artist. Many items of Coronet Limoges date from the period 1906 to 1920. The Borgfeldt company was in business from around 1881 to 1976. Among the most popular themes of Limoges porcelain ware were flowers, in particular roses, and fruit. In 2007, an online auction featured a vintage Coronet Limoges charger, circa 1906. The charger is hand painted in a pattern of white roses. It has a heavy gold trim and a scalloped rim. The same year, a Coronet Limoges gold-trimmed and scalloped plate with a design of roses and grapes also sold in an online auction. Game birds, fish, shellfish, natural scenes and animals were other themes of Limoges porcelain ware. Consistent with this were special plates sold by George Borgfeldt/Coronet Limoges, such as a 10-inch, mallard duck plate. In addition to the Coronet crown mark, it bears the signature of the artist, L. Conderly, on the back. This gold-rimmed collectible came from an estate sale and was sold at an online auction in 2007. George Borgfeldt was born in Meldorf, Germany, in 1833, and immigrated to America in 1855. He established a trading company in Nashville in 1861 and moved to New York in 1881, where he founded the Borgfeldt Trading Company. His Coronet maker’s mark was not exclusive to Limoges. It was also used as a mark for pottery imported from Czechoslovakia. “Coronet Registered Czechoslovakia” was a back-stamp of the Borgfeldt Company.